Chris Rainey, Brandon Rutley and Jonathan Bryant all scored touchdowns for the Montreal Alouettes as they opened their pre-season with a 26-9 win over the Ottawa Redblacks on Saturday night. Canadian quarterback Brandon Bridge was looking to impress his new team in his first pro start, and he succeeded. The Mississauga, Ont., native went 4 for 8, threw for 52 yards and a touchdown as the Montreal Alouettes opened their pre-season with a 26-9 win over the Ottawa Redblacks on Saturday night. "I was hoping to be pleasantly surprised with some of our young players and being shown signs of being able to possibly do what he (Bridge) just did and he grew a little bit," Alouettes coach Tom Higgins said. "It was a good start for him and I couldn't be happier." Bridge was one of four quarterbacks used by the Alouettes and orchestrated their best offensive surge in the third quarter. Bridge, a 23-year-old who was drafted by Montreal in the fourth round of May's draft, completed a pass to Chris Rainey to put the Als up 19-3. Brandon Rutley and Jonathan Bryant also scored touchdowns for Montreal in the victory. The game was played at Laval University and was considered a home game for Ottawa. Boris Bede, a former Rouge et Or kicker, received an ovation from the crowd. And he didn't let them down, converting on a 28 yard field goal for the Alouettes. Montreal's offence struggled to find a rhythm and only managed four first downs after two quarters. 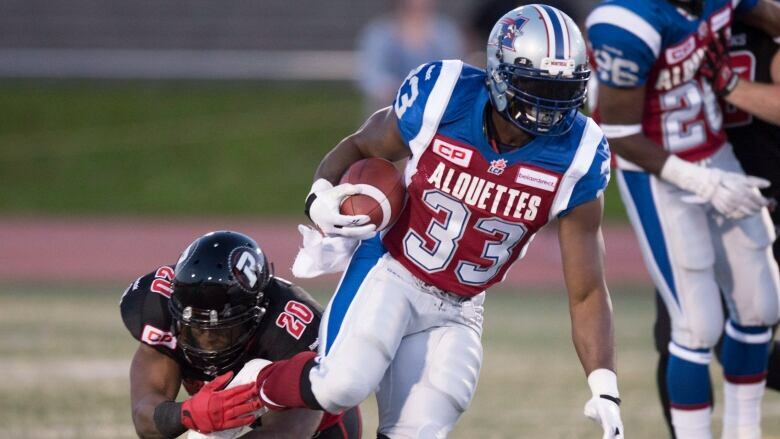 But the Als rebounded in the second half, scoring 14 points and adding 12 first downs. Jonathan Crompton also saw time behind centre for Montreal and struggled. He completed only 2-of-6 passes for 17 yards. Jonathan Hefney had an interception for the Als off Redblacks quarterback Henry Burris, which he returned 48 yards to the six yard line. Burris finished the game 12 for 21 with 126 yards. Thomas DeMarco found Khalil Paden with 1:40 left for Ottawa's lone touchdown. The ensuing two-point conversion was no good. "At the end of this game we feel we came out healthy," said Higgins. "We found some things out cause now it's evaluation time, overall very pleased."